The above line is spoken once in The Princess Bride. It’s said by Peter Falk, who plays a grandfather reading the story of The Princess Bride to his sick grandson (Fred Savage). He says it when the boy thinks he has the plot figured out and insists on interrupting. But it could also be said many other times, by many different characters, as everyone in the story within the story is looking to outsmart someone else. Sometimes to comedic effect, sometimes with more sincere consequence. This 1987 film by Rob Reiner, directing William Goldman’s screenplay of his own novel, is essentially a storybook come to life. As the grandfather reads, the movie becomes the book (or vice versa? 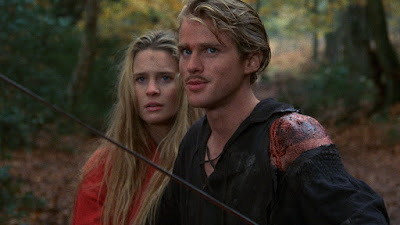 ), and the characters of Princess Buttercup (Robin Wright), her true love Westley (Cary Elwes), and all the rest all take over from there. 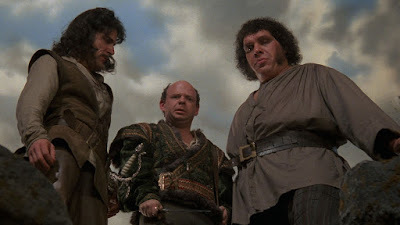 The tale is a basic one: thinking Westley dead, Buttercup is to marry the prince (Chris Sarandon) of the kingdom, but on her engagement day, she is kidnapped by a political saboteur (Wallace Shawn) and his henchmen (Mandy Patinkin, Andre the Giant). That’s when a mysterious figure in black shows up to save the day. Three guesses who that is. It’s all pretty straightforward. The Princess Bride is a family fantasy movie with a slight metafictional bend. The success of the film is largely dependent on Reiner’s balance of genre and comedy. 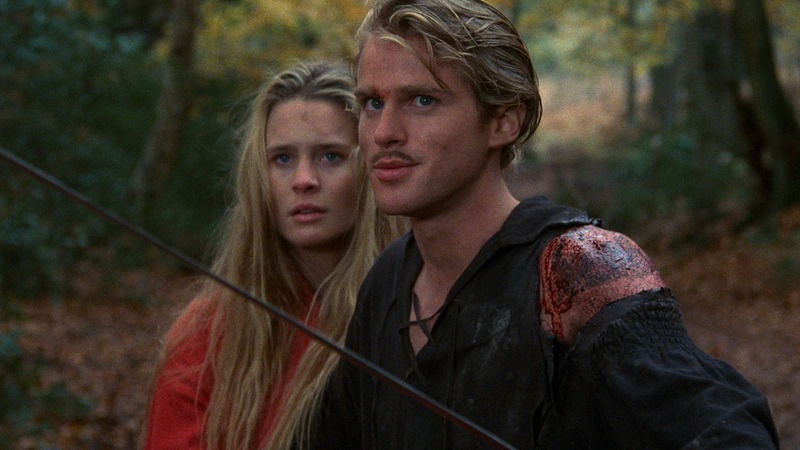 The Princess Bride doesn’t take itself so seriously that it can’t mock the fairy tale tropes that fuel its romantic fantasy, but just seriously enough that the story still works at being the exact thing it’s sort of making fun of. The Princess Bride is charming as hell, and beloved by many, but I wish it were wittier, honestly. The jokes come easy, and they don’t linger. There’s nothing in this movie that I’ll chuckle to think about tomorrow. The humor lacks the sharpness that Reiner achieves in other cinematic efforts--including This is Spinal Tap, a collaboration with Christopher Guest, who shines in a villainous role here--but that might just be down to demographics. 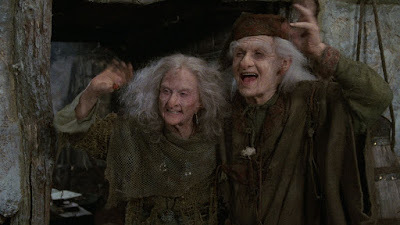 Again, this is a family picture, so The Princess Bride is meant to be a movie for all people, tame enough to please the kiddies, but with enough of a knowing wink to entrance adults. And for the true smarty pantses amongst us--who need to probably shut up the most--Goldman is having fun with the whole tradition of storytelling. The framing device exists to compel audiences to take The Princess Bride in the manner intended, but also doubles as a commentary on the relationship between a viewer and art. Fred Savage’s character at first resists the story, demanding it be more to his tastes, but surprisingly, when it takes him over, he becomes no less demanding, insisting the narrative stick to the clichés The Princess Bride is otherwise set up to mock. Moviegoers often want their say in all things: entertain me in special ways that will delight me, but don’t disappoint me by denying me what I want. Which is where The Princess Bride succeeds the most. The movie should satisfy every romantic desire, every adventurous impulse, that you’re looking for in a feel-good flick. Reiner keeps things moving fast, and he pulls excellent performances out of all his cast. Patinkin and Andre steal the show most of the time, but everyone here holds their own. Even a Billy Crystal cameo works, the actor getting in and out before he wears out his welcome or otherwise derails everything. 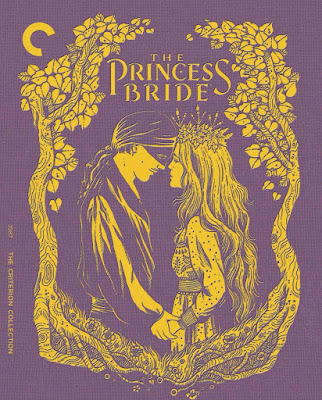 Likewise the whole of The Princess Bride. Clocking in at just 98 minutes, it’ll wile away a lazy afternoon, leaving plenty of time for whatever else you’re after, but also going by quick enough you won’t find yourself checking your phone in the final act.